Injection mold business. Bluestar now has 43 sets (55-2000 tons) injection molding machines, main processing in automotive interiors and exteriors, also medical parts, garden and home appliance parts. The main products are: 1) automotive: bumpers, bumper garnish, instrument panels, headlights, light transmission bars, fenders, switch panels and brackets, etc. 2) Gardening: mower engine cover, lawn mower wheel covers, etc. 3) House appliances: Air conditioning grille, medical car grille, washing machine shell. Major customers include: CAPSA, Toyota, Honda, Nissan, GAC Mitsubishi and Yanfeng Plastic Omnium, etc..
Equipment capacity, Bluestar now has 43 sets(55-2000 tons) injection molding machines, such as Toshiba, Haitian, TAYU, AGCO,etc.. Each injection molding machine is equipped with a robot arm and the corresponding cooling machine, mold temperature controller and other ancillary equipments to ensure automatic production and the stability of product qualities. Among which, the Haitian 530t and 850t two-color injection molding machine are mainly for automotive and medical parts’ usage. Bluestar has nearly 100 staff specialize in mold design. We set up R&D center providing from product development, project management, technology support, various mould design and manufacturing, quality inspection and after sale service to global companies. Along with the all aspects of secondary development, IM3 System, ERP System and mould standardize, all aspects have been enhanced such as quality control system. Design team uses CAD, CAE and CAM to assist design. CAD output 2D drawing and 3D image. 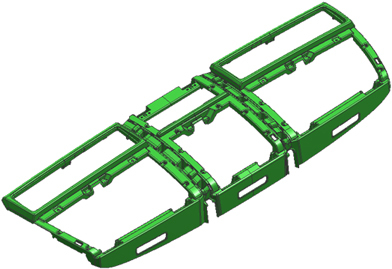 CAE simulation is to ensure optimal manufacturing mode and then using CAM for computer imitation. Rely on advanced equipment and 20 years experience, Bluestar have built a diversified customer from all fields of industry.